UNITED NATIONS, February 18, updated -- After the veto cast by US Ambassador Susan Rice to the Israeli settlements resolution, the post-veto spin began. 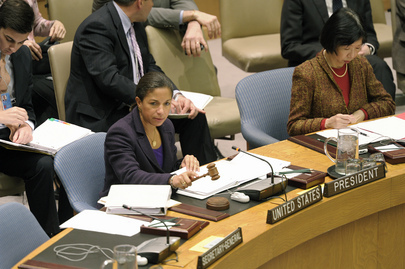 Rice scheduled a conference call with some reporters, rather than appearing at the UN Security Council stakeout. a very strong Presidential Statement from the Security Council which would have gone further than we have gone of late on the issue of settlements and other important issues, that would have been agreed by the Council, and we also would have been willing to use the use the upcoming Quartet statement for making some new and important statements on core issues including territory, as well as settlements. It is in our view very unfortunate that this proposal, which would have gotten unanimous support of the Council, was not accepted, because it would have led to process forward rather than lead to the outcome we had today. But the proposal of the trip to the region seems even more complicated today than it was yesterday and I think its viability is quite questionable at this point. Inner City Press asked again, but what has changed in terms of the trip being a good idea? Rice responded, the Council is not in agreement. This came to a vote, which was unfortunate. Our proposal had 3 elements that, taken together, would have moved the process forward. The parties didn't choose to accept that, which means they didn't place sufficient value on the utility of a trip, and the other elements. Back at the UN Security Council stakeout, Palestine's Permanent Observer Riyad Mansour bragged about the support shown by the resolution's sponsors. Inner City Press asked Mansour about countries which dropped off the sponsors' list, like Honduras, Trinidad & Tobago, Panama, Kazakhstan and Cameroon. 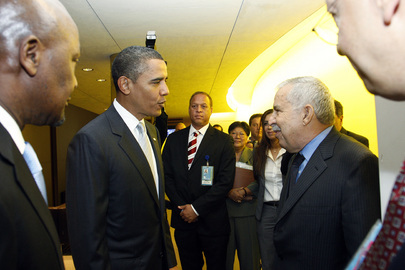 Yes but some also joined, he said, saying that only Israel supports its own settlements. On the proposed Council trip to the Middle East, Inner City Press asked Mansour if it would still be a good idea. Yes, he said, it would address Israel - Lebanon as well. When Lebanon's Permanent Representative took to the stakeout, Inner City Press asked him about escalating rhetoric between Israel and Hezbollah. That's not what we're here for today, he said, turning to take another question. But you're asked as Lebanon's Ambassador. On the trip, some opine that the US' offer was a bluff, asking how could the Council and US go to Lebanon (and meet Hezbollah), the Gaza Strip (and meet Hamas), and Egypt at this time? But Susan Rice said that the trip would have moved the process forward. Why not now? Watch this site. 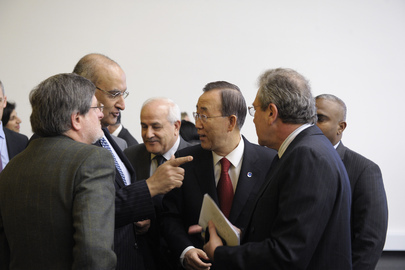 UNITED NATIONS, February 17 -- With the Israel settlements resolution pending in the UN Security Council, some of its non-Council member sponsors are moving to step back from the resolution, Council sources tell Inner City Press, mentioning among others Honduras, Cameroon, Kazakhstan and Panama. While the buzz on Wednesday was of a counteroffer of a Presidential Statement, a Quartet Statement in March and the Russia proposed Middle East trip by the Council. But while on a resolution members can simply abstain or vote no -- five members have the veto -- on a Presidential Statement members have to agree on every word, which they will not. Cameroon voted against include a US sponsored clause on the protection of gays in a recent resolution on extra judicial executions in the UN Third Committee which it chairs -- then did not vote at all in the full General Assembly, apparently at the request of the US, as here. Secretary General Ban Ki-moon, who a number of Ambassadors have told Inner City Press does not support the Russia proposed Middle East trip by the Council, held a rare press stakeout on Thursday morning. But no questions about the Middle East trip, or settlements resolution, were allowed. Ban's spokesman said questions had to be limited to what Ban read a statement about -- democracy movements in Egypt and Bahrain. Meanwhile the nitty gritty work at the UN goes on, of large countries buying off smaller ones with money. Watch this site. Footnote: a Council source also said that the US opposition to the Russia proposed Middle East trip, announced by Susan Rice, has changed not only as a couteroffer, but because "Rice didn't know that Lavrov had spoken to Hillary Clinton." We'll see.